I recently sat in on a Webinar with Lauren Freedman of The Etailing Group and Power Reviews. The Webinar was based on a study conducted by the Etailing Group involving 1,200 consumers who shop online at least four times per year, and spend $500 or more annually. We all know review content has many benefits – customer trust, long tail search engine benefits, reduced returns and so on. Customer reviews are a sensible entry into social shopping – the review thread is like an online forum. 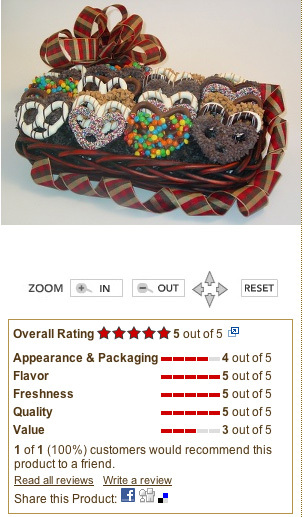 But populating your site with review content is a challenge for most if not all online retailers. Most customers are annoyed by entering credit card information. How can you motivate them to take time contribute product reviews? Jay Shaffer from Power Reviews offered this simple advice: ask for it. But he warns against dangling a carrot of a % or $ discount on the next order. One of the Webinar participants asked for elaboration – what’s with offering incentives? Shaffer mentioned that the manufacturing industry has a long history of paying folks to write canned reviews and testimonials. The ecommerce industry is sensitive to this issue, and really should shy away from these tactics as they might draw criticism or hurt the perceived authenticity of the reviews. Remember that if you offer these incentives to all your customers, they may not trust their peers as much. (On the other hand, it does encourage repeat sales which is good). 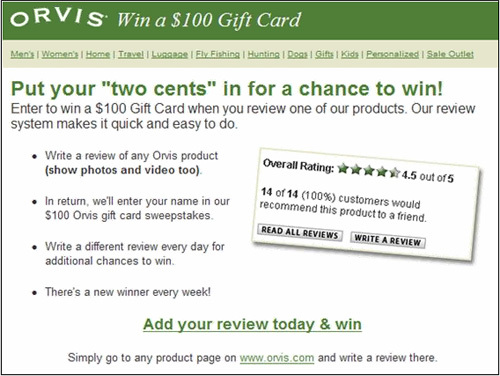 A better approach mentioned in the Webinar is Orvis’ contest with gift card incentive. Sent with a subject line: “Win $100 By Reviewing Orvis Gear,” customers were presented with a chance to win, but not a direct kickback for content contribution. Personally, I still think offering a bit of a discount on a future order is fine, it communicates that you value your customer’s business and time it takes to write reviews. It’s a thank-you. Many retailers offer discounts after purchase anyway with their order confirmation emails, I don’t see this as sinister. What’s your opinion? 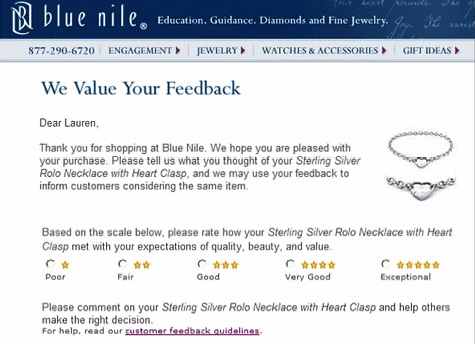 Not mentioned in the Webinar, but I think its a good idea is to remember when writing your review request copy that many customers are motivated by goodwill when contributing reviews. According to the linked article, of 90% of 1300 surveyed say they write reviews to help others make better buying decisions, and more than 70% want to help companies improve the products they build and carry. Communicating the feel-good benefits of adding your voice to help others can be as effective motivators as discounts and contests. I’m not sure if there is a direct input box further down on this email, but that would be a great idea – the customer doesn’t have to leave their email program to submit a review. The timing of the email follow up is key. Of course you must follow-up after the product is in your customer’s hands and the customer has had some time to use and evaluate the product. And you don’t want to wait too long, either. So review solicitation is like any other email campaign – care must be taken to choose an effective subject line, body copy and offer. And you should be monitoring your open and conversion rates. Split testing subject lines, timing, offers and email messaging will help you optimize your campaigns. One hiccup is if the item is a gift. You’re wasting your time to ask a gift giver to review the product, and this will skew your true conversion rates. A great way to identify gifts is to ask during checkout and offer a free personal note or special gift wrap option. This won’t catch all your gift orders, but for the orders that are indicated as gifts, you can remove that order from your email follow up campaign. Enclose a review request inside the product box if possible, so the recipient can still participate in your review program. Plus the gift recipient gets introduced to your company as the place where the gift came from. I’ve observed that gift retailers like ProFlowers, Red Envelope and 1-800-Flowers don’t have review content – and that seems to make sense. Most of the items will be gifted and what can you say about a bouquet of flowers? Delightful Deliveries is one example of a gift retailer that does use reviews, and claims it has raised conversion by 20% for items with reviews. Delightful Deliveries asks for reviews from gift giver and recipient. What I like about this approach is it doesn’t require the customer to write anything – you can rate the product on pre-defined criteria and answer a yes/no question “Would you recommend this product to a friend?” It doesn’t give you the long tail SEO benefit this way, but it does make it easy for a customer to get the overall opinion of the product quickly without having to sift through tons of reviews. You’ll notice customers also have an option to write a longer review. Famous Footwear has had success from including review requests within packaging sold in retail locations, claiming it drove more participation than any other marketing effort. I don’t see why you couldn’t do this for online channels too. There’s always a chance your email will be ignored, why not remind all end users of your products that you have a website and they can contribute reviews? I mentioned in yesterday’s post that in cases like a mom-and-pop organic coffee retailer, you could gather review content from people who haven’t purchased your product. Offering samples in exchange for reviews seems to me to be an ethical and effective way to get honest, unbiased content that will help you as a retailer and customers. Be sure to let the testers know that you’re not expecting rave reviews – just honesty. If you have a personal relationship with the reviewer, that can influence them to write positive reviews even if the experience was blah. So it may be better, if possible, to select strangers. Previous articleCall To Action Buttons – Does Size Matter?